With the All-Star game upon us, those who are not getting overly excited for the hybrid of New York Fashion Week and top NBA players, are looking about for interesting comments and quotes. This is a week off from the hassle of standard NBA games but it seems as though some people are busy focusing on the future of the game. 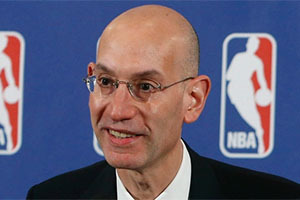 As you would expect, NBA Commissioner Adam Silver is a man in demand at the moment and he took part in a Question and Answer session with the New York Post in the run-up to the game at the weekend. Adam Silver was pretty clear on what his number one objective for the future of the NBA as he spoke in the build up to the All-Star game. Number one is the scheduling process, and that includes how many dates we require our arenas to hold, how early those dates need to be submitted to us and how we create the schedule from those events. We’re in the process of creating a new computer program to help us analyze all the information we get, and then when it comes to the schedule, we want to look at whether we can dramatically reduce the number of four games in five nights and the number of back-to-backs. In part, we recognize there are certain limitations, because it’s a mathematical equation in terms of the number of dates we have available and the number of games we want to get in. But we think we can make real improvements there in the scheduling process. Will back to backs be side-lined? When asked about the objective of making these changes, the response given by Silver would have been well received by all players and coaches within the NBA. He said; “My goal is to eliminate the four out of five nights and dramatically reduce back-to-backs.” Whether the TV companies, who have agreed to pump even more money into the NBA will agree remains to be seen. There is no doubt that clever scheduling can leave the TV companies happy without overworking the players but it will be a very difficult task to keep everyone satisfied. Will the pre-season element be reduced? One main focus is on reducing the pre-season element, which will ensure that players have less games to contend with. Of course, there will be plenty of sports fitness experts who will talk of the importance of having a proper pre-season to minimise the longer term risk of injuries. There is also the fact that the more pre-season games there are for players, the better the standard of games are likely to be when the action gets underway. Pre-season games are often slower and more disjointed. There are a number of reasons for this but one reason is that the players are not capable of racing around the court for as long as they would be one or two months into the season. TV companies and armchair fans may not be too happy to find that the first couple of weeks of games in the NBA are liable to be of a lower quality because the pre-season is no longer structured in the same way. Of course, this goes some way to indicating how hard it is for Silvers to keep everyone happy. There are times when he has people on opposite sides of the fence whose wants and needs are massively opposed. This may be why Silver gets the big bucks for his job, but it is not a position that too many would be in a rush to swap with him.